I had the chance to spend about a week in El Paso, TX for work. I was really excited to go since I had never visited that part of TX. I havent really found a great authentic Mexican restaurant in Atlanta, so I was also excited for the food! More on food later. I knew it would be hot considering it is August but I was suprised at the range of temperature. El Paso has that dry desert-like air so 104 degrees was not as bad as say 90 degrees in Atlanta with humidity. In the mornings and night it was very comfortable outside with a nice breeze. Of course, being Texas everything is spread out but they had a nice downtown area with mountains in the background. 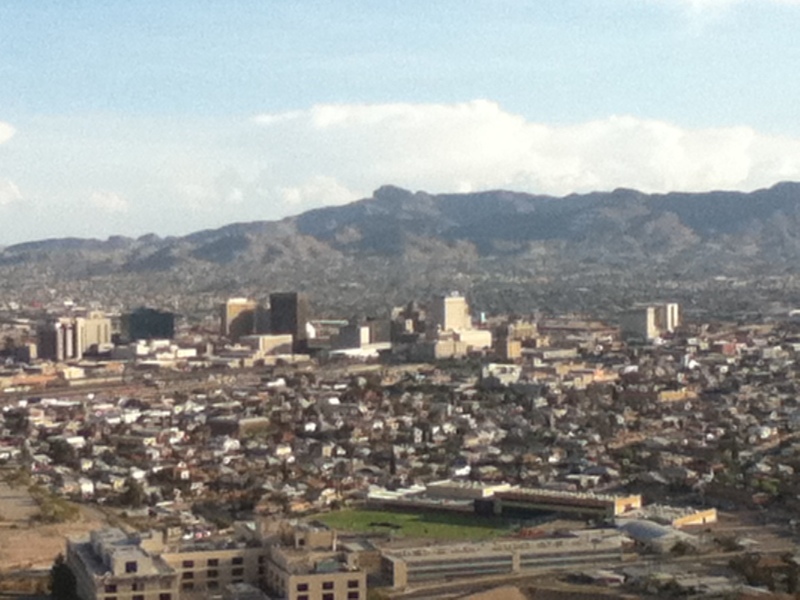 Another thing that I learned was how close El Paso, TX reallys is to Juarez, Mexico. Everything in front of the tall buildings in the downtown area is TX. Everything directly behind and along the base of the mountains is Mexico. Apparently at night, you can look out from the view and see light differences between El Paso and Juarez. A river divides the 2 countries but since there has not been much rain, the river is dried up. My original plan was to go right up to the border crossing and get a closer look but apparently it is against the law to take pictures there. 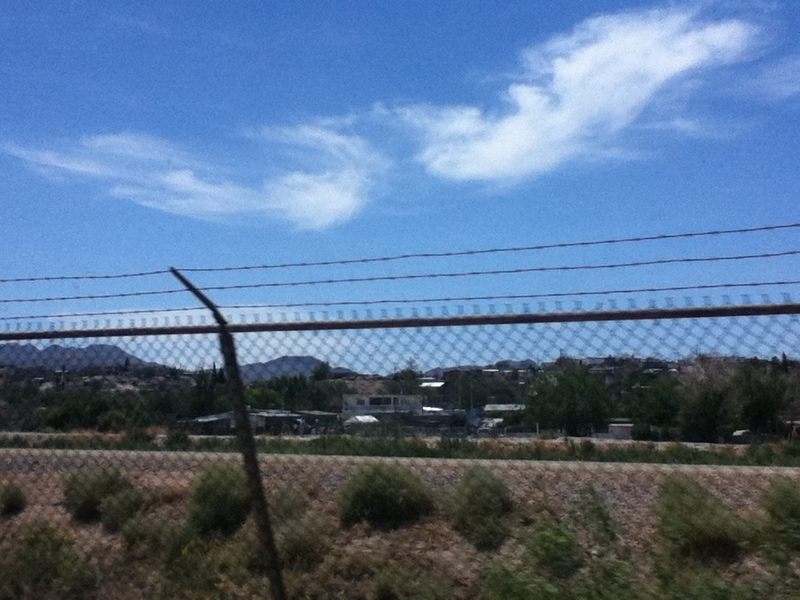 So we drove along the highway and saw glimpses of Juarez. 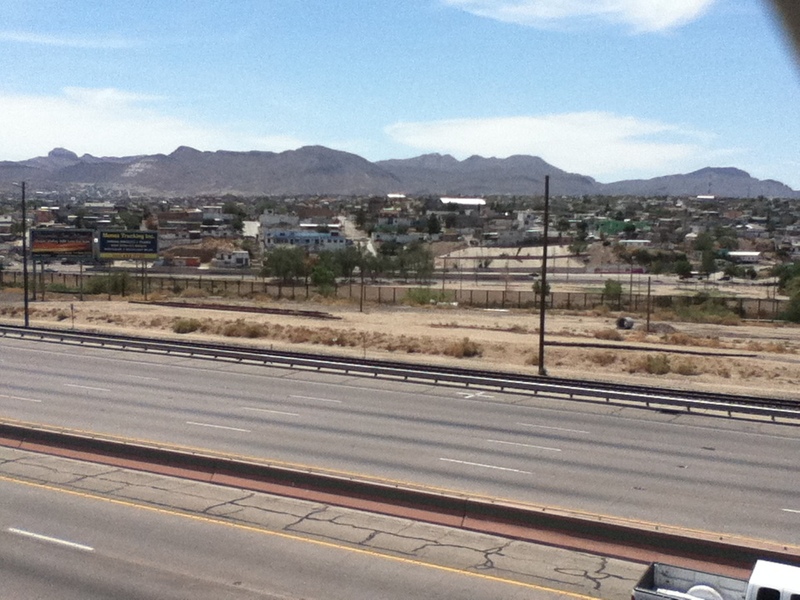 Juarez and El Paso are so close to each other but with the violence escalating on the Mexican side, we were discouraged from crossing the border. Apparently at one point there was fighting on the Mexican side and bullets actually hit a house in El Paso, that’s how close the 2 cities are to each other! Since I couldnt take pictures at the border, I went to another area, hopped out of the car real quick and took some pictures from there. It was amazing to me how on the other side of a fence and a road was an entirely different country. I soon learned that even though I couldn’t go to Mexico, I would be able to taste delicious Mexican food!!! I travel to El Paso frequently. I’m glad you enjoyed it there. Yes, Rim Road turns into Scenic Drive. Man, I’d love a house on that street!!! Anyhow, I’ve been wondering for years how the heck border patrol thinks it’s illegal to take a picture of the outside of the place. It’s in plain, public sight. How can that be illegal to photograph? Even if there is a law prohibiting it, I can’t see how it’s constitutional. I got that same bs in Laredo about 10 years ago. When I was on the Mexican side! What, were they going to come into another country and get me? I haven’t been over to Juarez in six years. It’s far too dangerous at this point. The cartels are shooting at each other left and right without regard to innocent bystanders. It’s sickening. Hope you did some shopping!! If not, El Paso Saddleblanket has a great online store. I know, I was surprised when I was told I could not take a picture. It was very sad hearing stories about Juarez. I was actually there for work so there was not much free time. I did get a chance to go cowboy boot shopping which was great! I still need to look up what saddleblankets are…but good to know there is an online store! Thanks!